It wouldn’t be good if you bought a second hand dishwasher without a warranty. It eventually created issues with efficiency, durability and reliability. 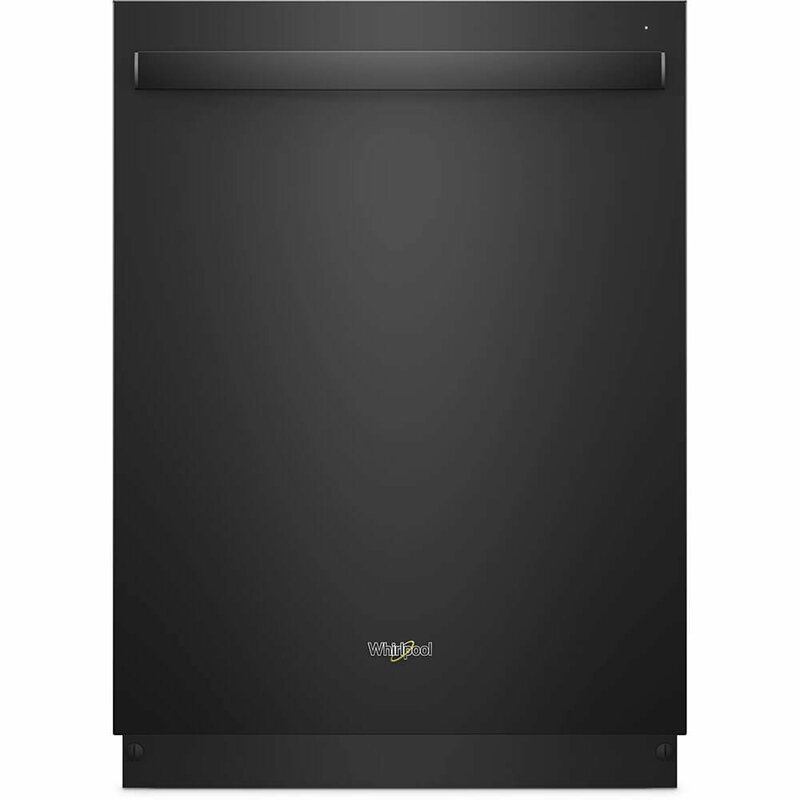 What about considering to get the best budget dishwashers of 2019 for a reasonable price? We can help you pick the perfect out of 10 top rated models. There are several types to consider; portable, built in and ordinary. They are essentially needed for the long term diswashing purposes. Dishwasher size depends on how many people live at home. If you are single and rent an apartment you better go for portable and small dishwasher. But enough talk. Let’s see which one is the best for you. One of the smallest portable dishwashers comes with 6 standard place settings; (dish rack, cutlery basket and cup shelf). It has a display on the upper righ corner to indicate what’s going on inside. Among good news is it has three colors; black, silver and white. I would prefer silver as it doesn’t show spots easily. Costing less than $300 it is considered as budget and first bad news is it sounds while working. $300 price will never include extended features. Let’s see inside: internal capacity of six standard place setting comprising, cutlery basket, cup shelf and dish rack. It can keep plates with max 10.5 inches in diameter. It has the little space inside so big plates can’t fit inside. Interior is made from stainless steel. Controlling can be done through smooth designed panel which includes buttons for wash cycle, timer, water temp control and switch on/off. 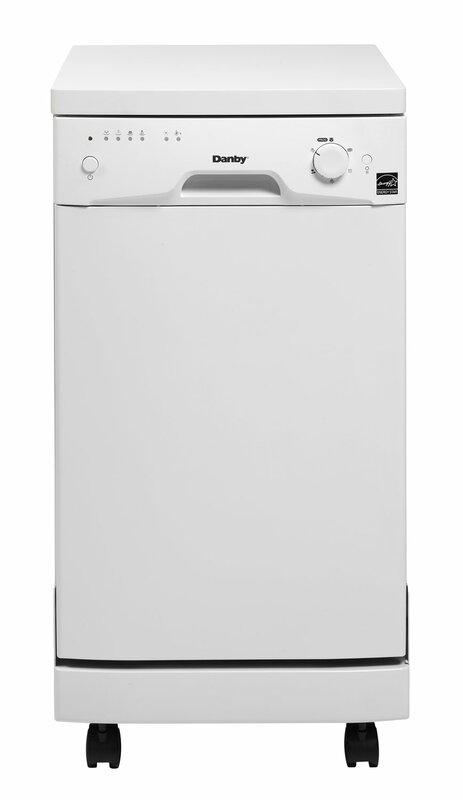 This built-in dishwasher that costing less than $500 has mid-standart specs such as electronic control rinse aid dispencer, three cycles, stainless steel design fights against corrosion and stains, protected against rust nylon coated upper and lower racks, and 24 overall inches size that can fit a lot of dishes. It is considered as mid-range while it does not have a display. 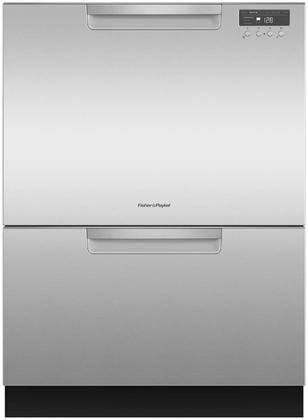 As other dishwashers it has four automatic cycles supported by eight standard plate settings capacity. Its three step filtering function has indicator light. Electronic control does not possess digital panel. It can be good for those who are not in love with a technology. Such a creative design Danby offered small desing for budget lovers. This shape gives more portability too. You can put different dishes on 4 place settings. Almost anything small can fit. However, do not load too many dishes. Accurately loaded dishes are washed effectively. 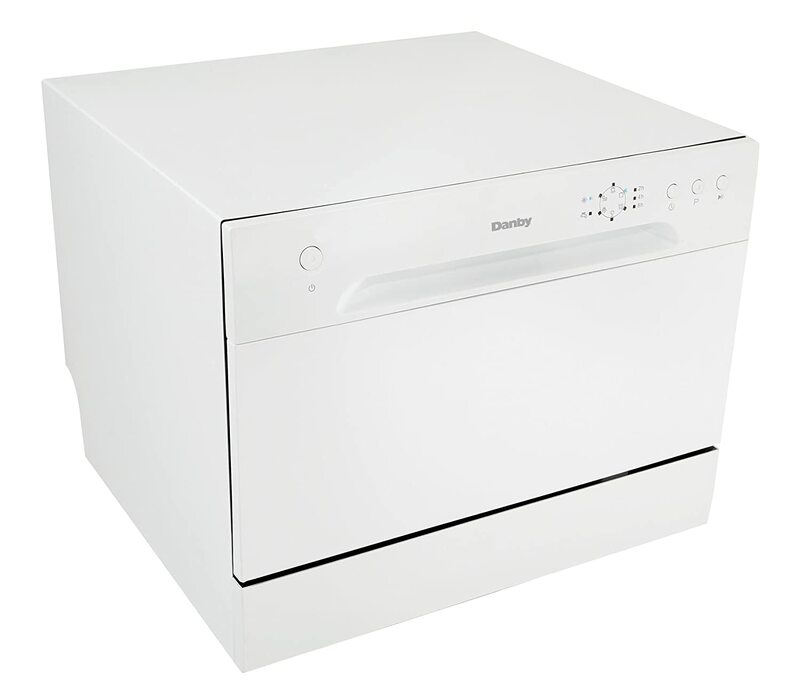 This dishwasher is perfect for travellers and singles who live sticking to a minimized life. Lastly, its control panel includes four buttons for power, washing options, cycles and stages. By bigger design with control panel seen outside, this model could manage to fully integrate everything. Full flexibility in managing the dishes is delivered by 8 formal settings inside drawers. Of course, to prevent rust and corrosion inside it has stainless steel interior. Wash cycles are six: heavy, normal, light, glass, speed, and rinse. Color has black finish on exterior. 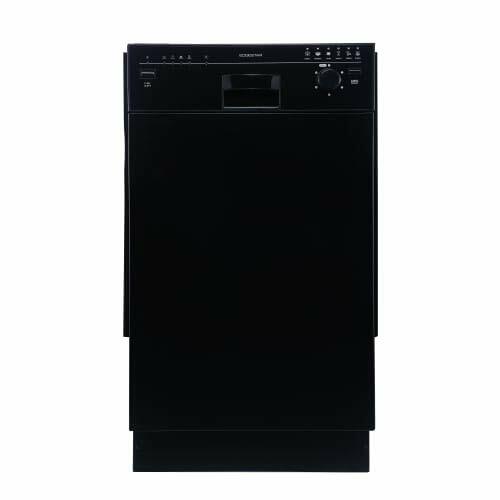 Gorgeous looking premium SD-9252W dishwasher has a solid design with size of 18 inches overall. Detailed dimension is width: 23 9/16 Inch, depth: 22 9/16 Inch and height: 34 Inch. With 6 washing programs, it can give longer washing process but your dishes will come out clean and tidy if you use a good soap or detergent for sure. alarm lock function enables doors keep locked while washing or resting. Sound is very low compared to cheaper dishwashers. This model still belongs to budget territory thus having it will only create little noiseless washing. Electronic control is on the top with LED. Good for tech lovers who want to see digits anywhere. ADA compliant and Energy Star certified too. This model from Danby has fully integrated control panel on the top and portability safe eight wheels. While having single drawer design it has 8 place settings which allow a user to put a dish of any size. It also has stainless steel body for protection from rust and corrosion. The main feature is a quiet operation system which makes less noise. Controlled with a panel located on top. Turner and several buttons can be seen when the door is open. Wash cycles are intensive, normal, economy, rapid, glass and soak. 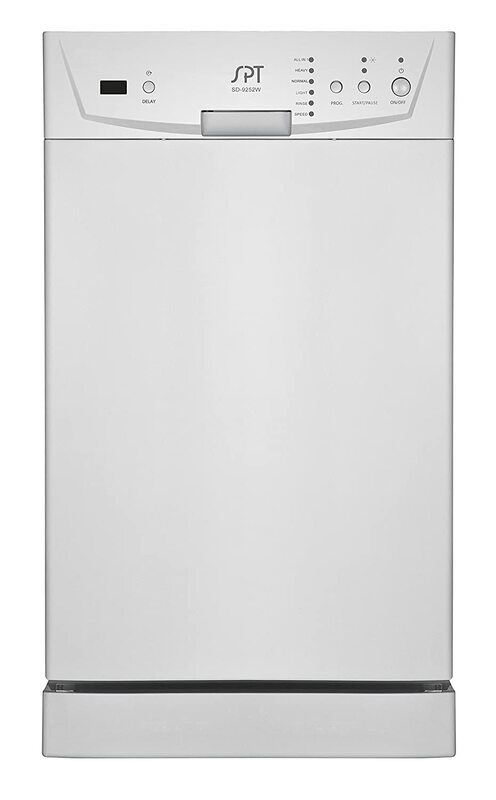 Overall, it is a big dishwasher with budget price reaching around $1000. Washing machine looking ADB1500AD falls into budget area which has to offer reasonable features. 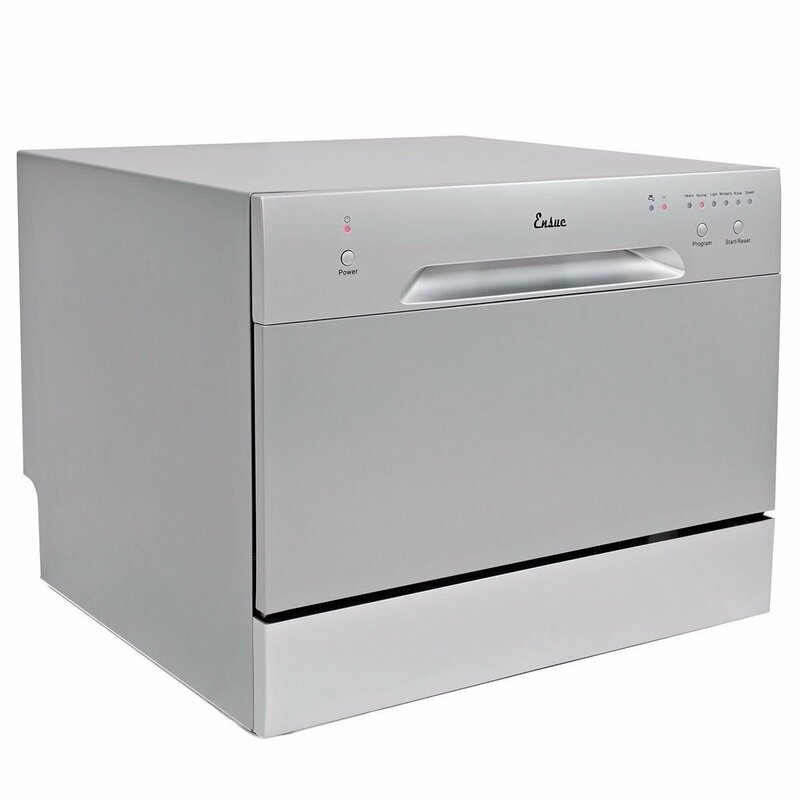 Built in and stainless steel body includes typical premium dishwasher features. Single door allows it to fit different sized dishes into 12 place settings. They are washed by six cycles: soilSense, heavy, normal, 1-hour wash, soak & prewash. Four wash options await your dishes: 1-24 hour delay, sani rinse heated dry, hi temp wash and control lock. Big families need such a cheap dishwasher with price tag lower than $700. 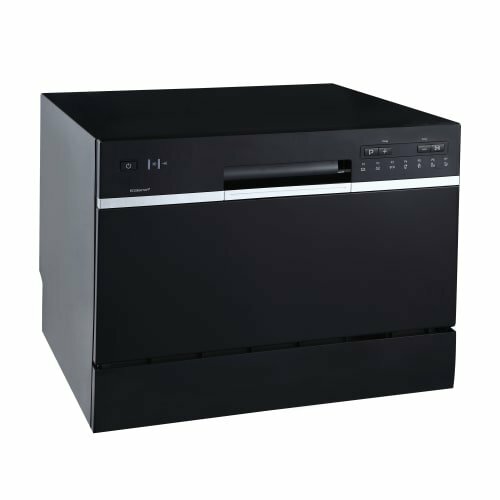 Just like EdgeStar DWP62BL this model has portable design and fully integrated control panel on the top of the drawer. Not a big size, perfect for big students, travellers and singles. CSA certified. Power cost is low which is less than big budget dishwashers. Remember, it has stronger washing and drying features. Control panel is on the top as normal for small dishwasher. 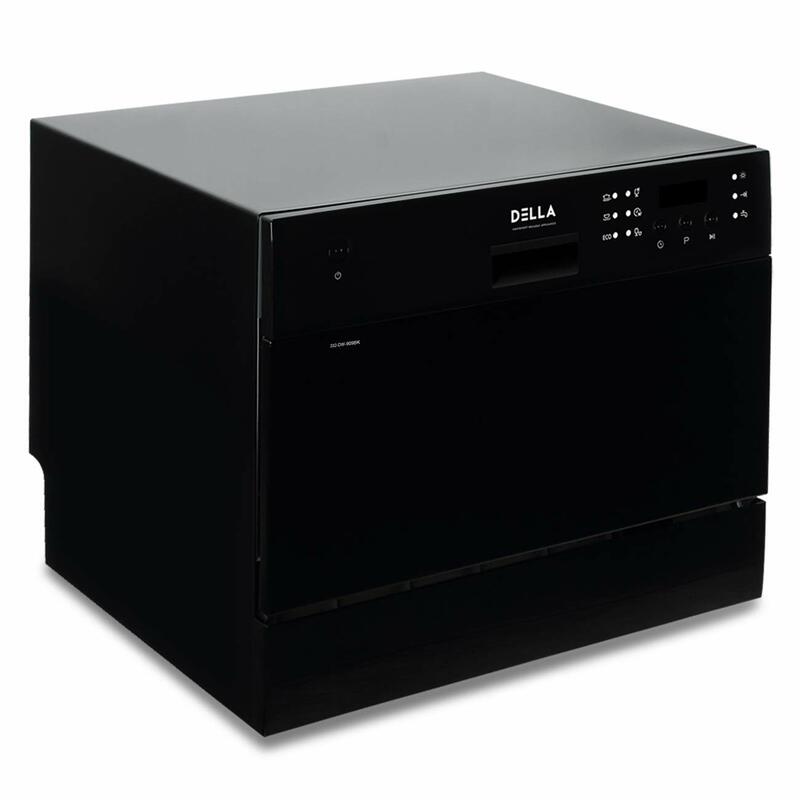 If you are portable dishwasher lover you could consider buying this model for under $300. Its control panel with touch pad are on the edge of the drawer. Five wash cycles and six options deliver a decent result. Handle is big and so nicely located which enables easy pulling. Noise is surely low. 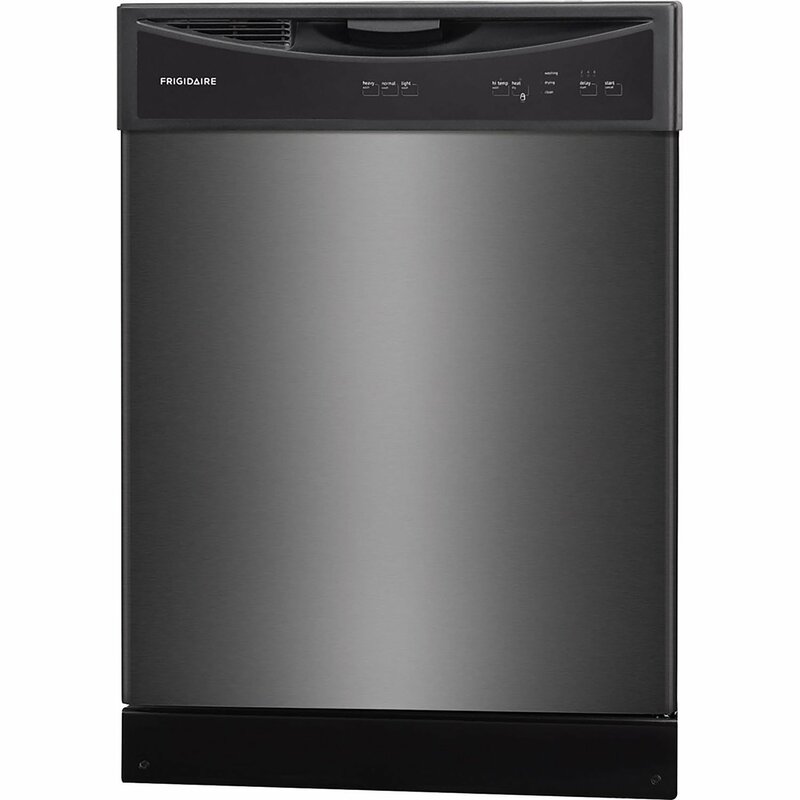 Premium looking dishwasher has a reasonable price tag under $900. I chose this model as the best compact. Here is why: small size which is the biggest in typical budget area, quick wash feature for rushing users, single drawer delivers more accurate dish placing with 5 place settings. 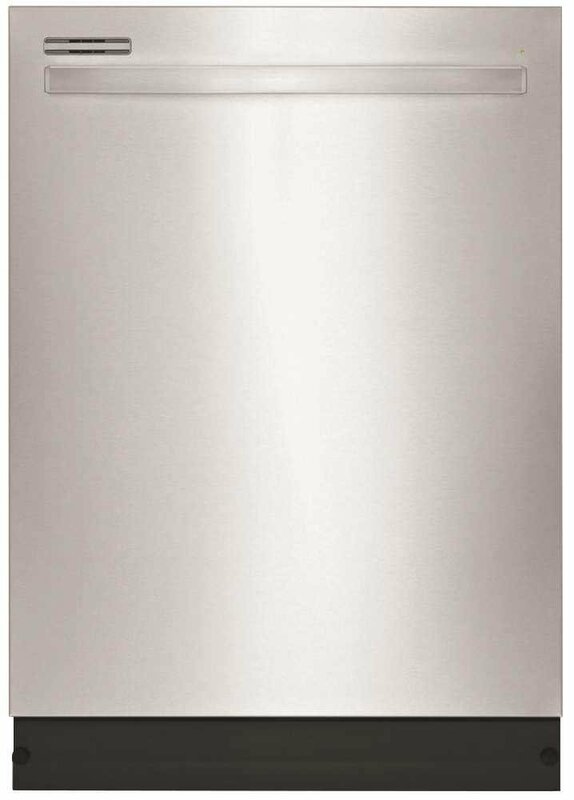 Stainless steel body gives smooth design and durability. The electronic control panel is smaller but compact with efficient number of buttons. Even though price is more than $600 its features make any compact size lover satisfied. I have chosen only the best budget dishwashers by listing top 10 most durable, noiseless, efficient and powerful. You may choose any one of them according to your budget and preference. I strongly recommend to pick from well-known brands. At the point when your dishwasher passes on, you may rapidly come to miss this efficient technology. Stacking a dishwasher and squeezing begin can spare you once again 230 hours per year, contrasted with washing and drying by hand, as indicated by Energy Star. 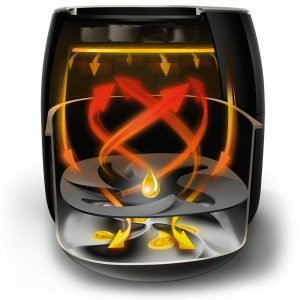 Here’s the way to locate the best dishwasher 2019 for budget and needs. Ordinary or normal dishwashers are 24 inches wide. They offer for $225 to $2,200. You’ll see well finished 100 models in web dishwasher reviews, alongside a couple of dishwasher drawers, for $1,000 and up. Whatever you pick, consider utilizing a cleanser that tidied up in our tests to take full advantage of your machine. Dishwashers are accessible in white, bisque, dark, slate, stainless, and dark stainless. Dishwashers once looked basic the same as, however no more. A few producers have saved the look, moving the controls to the highest point of the door so they’re covered up when the door is shut. On some models, the brand logo is unlike gone, and a recessed pocket handle replaces a bar. With the brand name and bar handle gone, makers understood that their stainless dishwashers would look great in a kitchen beside stainless machines from different brands, thus did customers. The width and profundity of a traditional dishwasher is planned for a hole estimating 24 x 24 inches. Nevertheless, fitting in your new dishwasher could be a test in case you’ve tiled the floor or revamped your counters, changing the stature of the cavity. So before you pick, measure your space and approach the retailer for the full stature go (and bear in mind to represent alteration of the leveling feet). When shopping, look for how the dishwasher’s inside is arranged—the dividing of tines, and the situation of the flatware crates and racks. You require a dishwasher that works for how you cook and eat. Despite they aren’t the best in our tests, you can in any case get a dishwasher that is great at cleaning, and great or even incredible at drying. A few number of models in this value run presently have a dirt sensor, which alters the process duration’s and water use to the heap’s dirt level, enhancing water proficiency. Furthermore, some even have a stainless steel inside. So what’s the catch? Their features are essential: Adjustable racks and stainless steel tubs are not guaranteed. Wash times are regularly long, and most dishwashers in this value extend are moderately boisterous. You can get a calmer dishwashing machine, magnificent cleaning, and advantageous features that may make it worth spending more, for example, customizable racks and adaptable flatware spaces, alongside a stainless tub, which tends to oppose recolors superior to plastic. A dirt sensor is normally guaranteed. The styling changes, and the dishwashers are completely silent. You never again need to pick between valuable specs. Inventive features, for example, extraordinary wash zones for vigorously filthy things, and WiFi network—are included. They regularly have two little, stacked drawers that you can utilize at the same time or independently. In any case, they’re costly, and the models we tried haven’t executed also in general as most customary dishwashers. Limit is moderately little, constraining the amount you can wash on the double. If you have a bigger family, cleaning up the dishes after supper is an overwhelming task that you most likely attempt to postpone until the latest possible time; yet it’s one that is got the opportunity to be finished. This is the place a dishwasher turns into an advantageous tool. Dishwashers spare from the issue of standing over the sink and clean your grimy pots and container, however don’t be tricked in supposing you don’t have to do anything with the exception of load up your dishwasher and turn it on. Like all family single appliances, dishwashers must be cared for to guarantee they continue running easily. It’s anything but difficult to fall into the propensity for disregarding your dishwasher, however this can prompt issues, for example, blockages and breaks over the long haul. While it’s helpful to just place your dishes straight into the dishwasher after you’ve wrapped up, it’s recommended that you rub your plates previously doing as such. Dirts from your plates can make your dishwasher wind up obstructed, making cleaning less compelling. Additionally, they can stall out to dishes once the cycle is finished, abandoning you with the activity of handwashing them. It can be enticing to fill your dishwasher to the overflow by stacking mugs and bowls over each other, particularly when you have a major heap of messy dishes, however this isn’t exceptionally reasonable. Pressing your dishwasher too firmly implies that pots and container won’t get an intensive clean and you’re probably going to find that once the cycle has completed, some haven’t been cleaned by any means. It’s a superior plan to easily fill the dishwasher and after that wash any residual mugs and plates by hand. A helpful trap to know is that the first occasion when you begin your dishwasher cycle, the water will be chilly, so run your heated water spigot previously until the point that the water is hot to the touch. Along these lines, your first dishwasher cycle will be hot, as opposed to frosty. Furthermore, this is an essential tip to hold up under at the top of the priority list during the winter months when it takes more time for the water to warm up. Despite it’s your dishwasher that does the cleaning, your dishwasher additionally should be cleaned now and then. After some time, sustenance bits and grime will begin to develop and could prompt issues with cleaning should you leave it unattended. Under the lower sprayer at the base of your dishwasher is a plate that is normally removeable. After taking the plate out, you’ll discover the sustenance that didn’t exactly make it out of the deplete. In case your plate can be removed completely, wash it in the sink and utilize a paper towel to gather any sustenance bits from the dishwasher trap. You should likewise clean the elastic seals of your dishwasher at regular intervals, since these can likewise gather grime and microorganisms. Just wiping them with a fabric will keep them in tip-top condition.